Saturday, I woke up at 5:30 in the morning in order to start my journey on South Mountain to do National Trail. 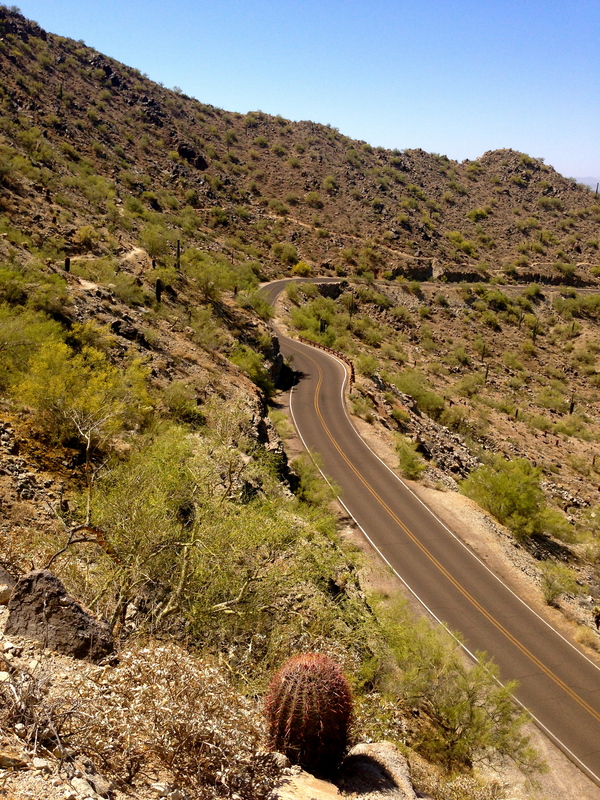 National Trail is the longest hiking trail on South Mountain and it goes across the entire length of South Mountain. From the North East all the way to the South West. Since this is such a long trail and the weather is getting hotter, we started off at 6:30 am. The trailhead is located off of 48th street, between Guadalupe and Elliot. From the trailhead we walked for about 30 minutes until we hit the beginning of National Trail. Starting off, it was tough. Lots of upwards hiking, but nothing to drastically steep! (I was actually impressed with myself, seeing as how I didn’t really need any breaks.) There are lots of bikers moving past us but we always seem to catch up with them. While they are taking their breaks to catch their breaths, we catch up and pass on through. After about an hour of National Trial, the toughest part is over and it’s pretty much flat or just uphill a little. 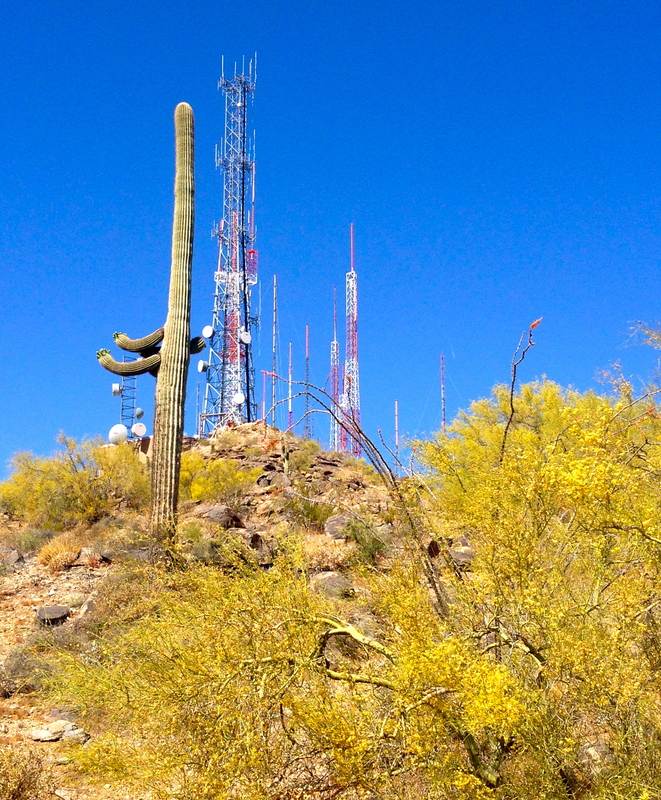 The most interesting part is hiking a along the towers of South Mountain. Those big red towers you see sparkling in the East Valley during the night-time. Here we were standing just a little bit below them. It’s an amazing feeling to have that landmark of validating how high up we had made it on South Mountain. National Trail is interesting because you also witness the desert landscape change. You see, the big dark brown rocks, which have fallen and stumbled upon each other in the Hidden Valley area. You walk along the side of a cliff that gives you an amazing view of the inner rolling hills of the mountain. A little while after making your way across the towers, you’ll see San Juan road with curves, and movements of the desert lands. It’s pretty amazing and since it’s such a gradual change before you know it, you look up and feel like you are on an entirely different mountain then when you first started. There are two points where you can stop and leave National Trial. One stop is located about 5 miles from the start and the second stop is 9.7 miles away. Unfortunately we had to end our National Trail adventure at the second stop. My knee had started bothering me and it was becoming an unbearable pain, especially going down hill. So in order to get off at this second stop, we had to go down Telegraph Pass. Obviously, if you need to stop and get off the trail at either of these locations, you will need to have someone come pick you up. I have to admit, I was disappointed that I couldn’t complete the whole thing in one trip. But I know it was way smarter of me to stop when I did instead of pushing myself too much. There’s always next weekend to finish part two. And I have to admit, it’s pretty to cool to know there’s a sequel! I live at the base of South Mountain and often times take for granted the beauty that it bestows upon us. Taking walks at sunset in neighborhood are a reminder of how gorgeous the desert naturally is!